You will also find the Bass and Massey genealogy on Daniels grandmothers side, trailing back to Theophilus Bass, a member of the Legislature in Jefferson City, from Taney County, Missouri, on one side. And on the other, back to the Irish James Massey, who came to the US to seek his fortune, and was one of the earliest pioneers in Greene county, Missouri, just east of what is now the city of Springfield. James Massey was a captain in the war of 1812. Also the McAfees were early emigrants, from Antrim in Ulster, they settled in Missouri in the 1830s. 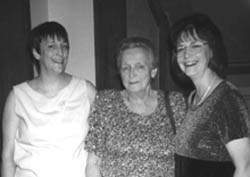 Dale Casey with her mother June (Bessette) Casey and sister Diane (Casey) Bair, photo taken June 26th 1999.